So many things that just don't fit in anywhere else. But that doesn't mean they're not interesting! USA Random Items overflows onto the third page. As usual, things on these pages are subject to change or move as more catagories are created. 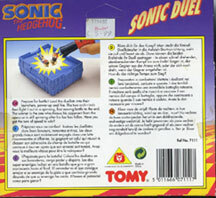 This is a rare and unusual item by Tomy Toys. 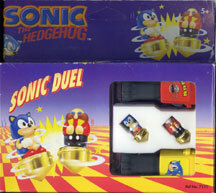 The "Sonic Duel" top launcher set. You don't see many of these around. Photos all courtesy of MCRG. The premise of Fighting Tops was around before they invented Beyblade. This set is from somewhere in the 1990s, and features quality metal tops with mini figures on top. What makes this a great addition to your collection is the fact that it's an American item (early USA) and still has Eggman and not Robotnik on it. You put the tops in those cone box things, and then launch them into the curved plastic 'arena'. The spinning will cause them to wobble and hit eachother, which is the fight. This is an unusual and interesting toy. Now here's something random. Swicherz. They are like an ornament for your items. (But why?) You stick (permenently!) the bases to stuff, and then click off and swap the heads. Just stick them to something out of the way or they look likely to get snapped off. These are TOTALLY OVERPRICED. They cost more then an entire action figure for EACH at $6.99. Gear is not afraid to call 'ripoffs' when they appear. These are a rip! They aren't useful, they klutter things up and cost more than something 10x more fun. You can buy them at Hot Topic, in fall of 2006. Available in Sonic Amy Shadow and Eggman so far. You can see how big they are with the controller and X-Box comparison in the photo. Look at the glittery blue paint in this close up...it's like what's on a real car! 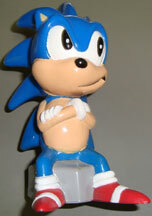 Matchbox gets in on the action by plastering Sonic X images onto some of their famous metal tiny cars. Each car is a real type that you can drive, such as Sonic is on a Pontiac Piranha, Tails is on a Volkswagen Beetle 4X4, and Knuckles is on a Chevrolet Suburban. They themed the cars with the character, name, and tiny Sonic X logo as an added detail. Each one really rolls and is made of metal. They were available individually (seen here) or as a multi-pak. The individuals are confirmed at Eckerd (a drugstore) in the USA. The multi-packs were available at Target, and Toys R Us in the USA. They started around 2004, but many hung around until at least 2006. Photos by Memeki. The multi pack contained all 5 cars, but doesn't tell you what type of car they are. As you see above, Eggman is on some sort of panel-van and Chris is on something like an SUV. Neither of these have glittery paint like the Sonic car. Eggman's is blackish/brown. The Tails car has a clear/yellow plastic light bar on the top (it doesn't do anything) The back of the multi-pack is also open to view and doesn't really have any info or extra art. 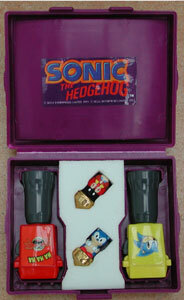 The pack is in the collection of SonicGear. This is a promotional Yoyo. It was used to help promote Sonic Advance on the GBA. 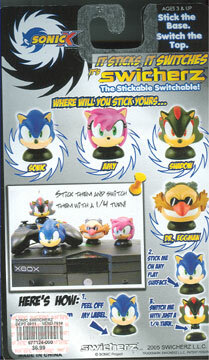 It was likely available (given away/sold) at the Sega booth at E3 during the year where they released Sonic Advance 1. 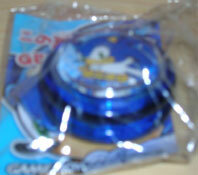 As you can see, it's a nice and shiny blue yoyo with a clear front that contains the game's name and large Sonic head. A yoyo is a rather interesting promotional item for a show like this, and it looks to be of good quality. Photo by Nick M.
This is the rare Sonic Bubble Blower. The figure you see is actually a jar for the bubble-soap-type solution. His head unscrews, acting as a lid, so that the bubble-wand can fit inside. 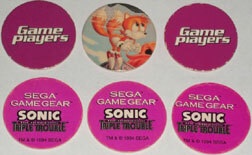 This resembles one of the Sonic coin banks (as he is seated on an item) but it is likely smaller. With the lid unscrewed, you can see the figure is actually pretty wierd. Look how long the 'neck' of the bottle is.The bubble wand is attached inside the top of the head. Bubble lid photo by John. The "bop bag" industry must be secretly flourishing to warrant such a giant selection of these things! 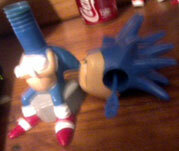 Here we have yet ANOTHER Sonic theme punching bag bopper. Available in the USA from...somewhere you can find these on Ebay. This one is about 4 ft. high, and weighted at the bottom. Not really an electronic item, nor is it an ad, a cameo or a retail display...this is a start-up screen. 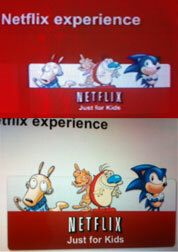 If you use Netflix service for your PC, smart TV or (in this case) WiiU, and select the "Netflix Just for Kids" area, various (in their opinion) Kids Characters show up...and, well here's Sonic! But notice! They took that mysteriously re-occurring "Blue Arms Mistake Sonic" who frequented Australia & also for some reason the Sonic Underground box art.